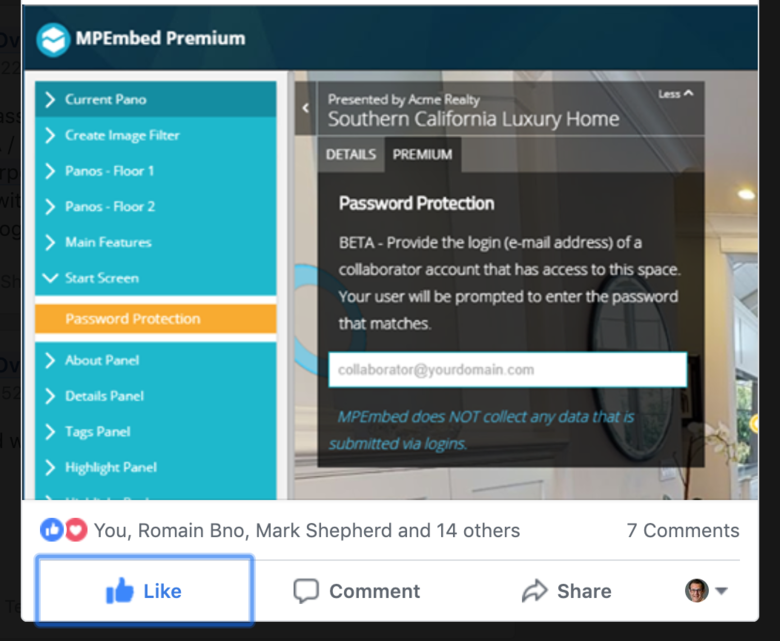 MPEmbed added password protection (beta) for Matterport 3D Tours. 1. Set a space to private in my.matterport.com. 2. Setup a collaborator account with view access to it. 3. Add the collaborator account login (email address) in Premium to the new 'password protection' option. Be sure to logout of my.matterport.com completely when you test. If you ARE logged out, the window will have a black background. If you are logged in, the background will be the normal, expected thumbnail. I am on the fence as to how I feel about the feature. I had an idea how to do this, I implemented it, I had to make a few compromises, and this is the result. It's really not up to my own quality standards as I feel that it is a little bit goofy. There is no other way to do this.. I am curious to get some feedback as to how you feel about it. Does it do the job? Would you use this? Is it too weird? (it opens up two tiny pop-up windows for a split second ... which is something that I really do not like). There are a few features missing: Minimaps no longer work; Mattertag Colors also cannot be detected. If you are testing this feature, please be aware that yes, certain features may not be working with it right now. This is an experiment at the moment. 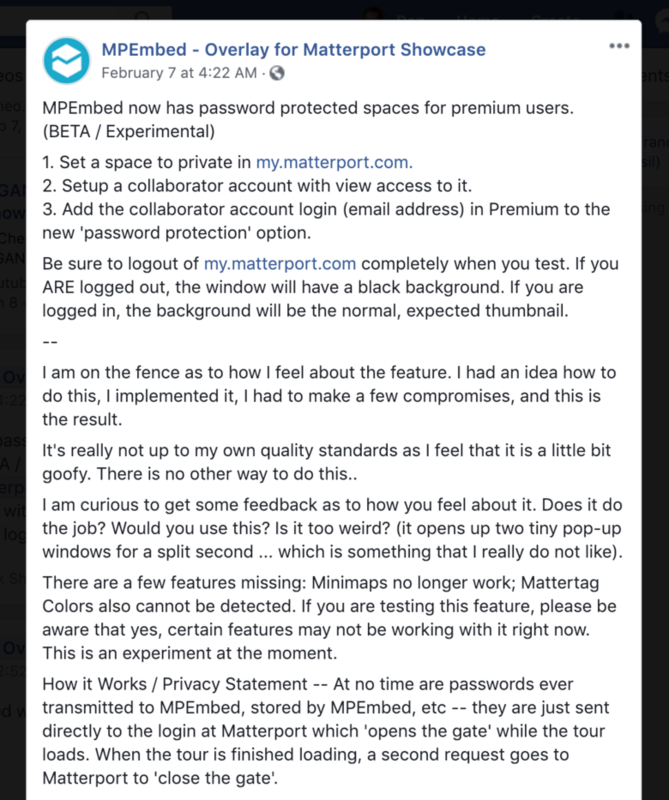 How it Works / Privacy Statement -- At no time are passwords ever transmitted to MPEmbed, stored by MPEmbed, etc -- they are just sent directly to the login at Matterport which 'opens the gate' while the tour loads. When the tour is finished loading, a second request goes to Matterport to 'close the gate'. What are your thoughts about MPEmbed Password Protection Beta? Seems like Matterport would make this(password protected) a viable option since it has been requested many times. It seems like GeoCV is so much more in tune with customer needs/wants and tries to fulfill them. I hate to slam Matterport because they have a great product but yet seem to miss the boat on these opportunities so often. MPEmbed's password protection is, I think, the only true way to password protect a space. The only way to lock a space is to do it from my.matterport.com, therefore this piggyback's on that without using any hacking -- it simply launches a tiny window that logs in with the credentials that you type (never stored) and auto closes the window, then it logs out when the tour has loaded. In building this, it has occurred to me that Matterport's solution for this is soooooo simple. If there's a space that is private, then when you embed it, it should have a login box on there. Type in a valid login that has access to the space (Collaborator account) and you should be able to access the tour. This is not rocket science and would require very little infrastructural work to setup. I like it. I often get rejected by high-end luxury properties because they don’t want a tour publicly available and circulated. This will combat that and give me a good counter response.